After a day of walking, there’s nothing better than stumbling across a little café where you can sit down for coffee and maybe even treat yourself to a slice of cake… or two. Our latest trooper is situated in an ideal spot for ramblers and non-ramblers alike. We are pleased to welcome The Riverside Café at Yarwell Mill to the troop. This cosy café can be found at Yarwell Country Park, on the banks of the River Nene. Yarwell Country Park is a 27-acre development, lending itself perfectly for a walk by the river. It also has a 5-acre lake for fishing where you will find an array of fish living in its depths. If you’re planning on retiring soon and looking for a retirement home, look no further than Yarwell Country Park. They have a huge choice of fully furnished residential park homes available, all of which have been built to a very high standard. There are also 45 moorings available on the river Nene which are available for new homeowners; along with a slipway for launching boats too. Yarwell Mill Country Park has a large camping site with over 100 tent pitches. Some of these pitches come with an electricity hook up too. The campsite is family orientated, making it an excellent spot for a family holiday or a quiet weekend away. While you’re out walking, you will no doubt discover The Riverside Café, which plays host to delicious cakes, sandwiches and other hot and cold snacks. Weather permitting, Riverside Café is open pretty much all year round too, so whatever time of year it is, arrange to pay them a visit. 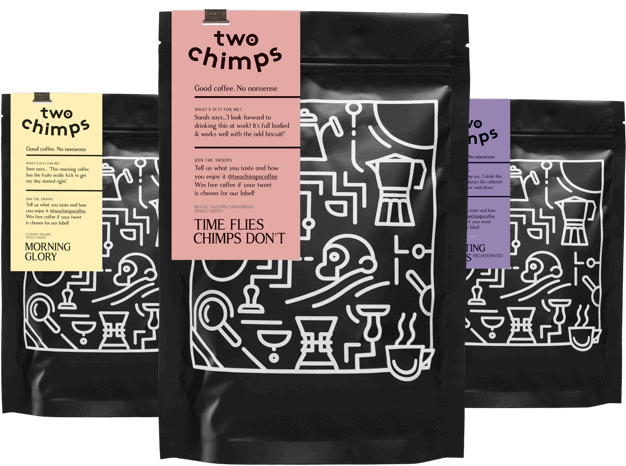 Alongside cakes and other food items, The Riverside Café now proudly serves Two Chimps Coffee. Currently, you can enjoy the super creamy ‘Box of Frogs’ from El Salvador and our sparkling water decaf ‘Starry Eyed’ form Costa Rica, both of which are served through their espresso machine. The coffee served at Riverside Café is speciality coffee. This is a much higher grade of Arabica coffee and is handpicked and sorted to ensure there are no defects. Before the ‘speciality’ title can be given to a coffee, it is first cupped and then scored on a number of things such as aroma, taste and mouthfeel. If a coffee receives a score less than 80 points, it won’t be a speciality coffee and we simply won’t buy or roast it. The chimps at Two Chimps towers are very fussy over coffee! To make sure the coffee served is always at its peak and its freshest, we contact the Riverside Café at the start of the week for their coffee order. This coffee will be hand roasted to order and delivered a few days later. So head over, pitch a tent and grab an awesome coffee, while you bask in the great British sunshine! Tried our coffee somewhere and couldn’t get enough of it? Head over to our shop to get your hands on a bag today!